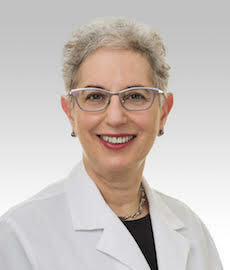 Dr. Winter is Professor of Medicine in the Division of Hematology/Oncology, Feinberg School of Medicine, and a member of the Robert H. Lurie Comprehensive Cancer Center. She is a graduate of Bryn Mawr College and the University of Pennsylvania School of Medicine. Following internship and residency in Internal Medicine at the University of Chicago, she completed fellowships in hematology/oncology at Columbia-Presbyterian Hospital in New York, and Northwestern University in Chicago. Dr. Winter’s clinical and research interests focus on the malignant lymphomas (both Hodgkin and non-Hodgkin), particularly the development of novel therapies and the investigation of clinical and biologic correlates of prognosis. She is a Councilor of the Executive Committee for the American Society of Hematology, and a member of the NCI’s Lymphoma Steering Committee. Dr. Winter is a long-standing member of the Lymphoma Steering Committee for the Eastern Cooperative Oncology Group and its previous co-chair. She served a six year term as a member of the Hematology Subspecialty Board of the American Board of Internal Medicine and has been a member of the National Comprehensive Cancer Network Hodgkin Lymphoma Guidelines Committee since its inception.